(Nanowerk News) A tiny vibrating cantilever sensor could soon help doctors and field clinicians quickly detect harmful toxins, bacteria and even indicators of certain types of cancer from small samples of blood or urine. Researchers from Drexel University are in the process of refining a sensor technology that they developed to measure samples at the cellular level into an accurate method for quickly detecting traces of DNA in liquid samples. According to lead researcher Dr. Raj Mutharasan, a professor in Drexel’s College of Engineering, the group’s unique application of lead zirconate titanate (PZT) to current piezoelectric-excited cantilever sensor technology has created a way to conduct more sensitive and timely tests for DNA. This DNA test will allow for quick identification of harmful cells and bacteria. 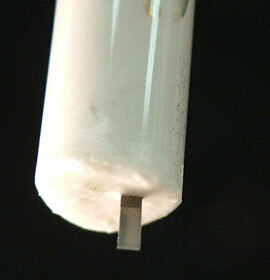 Tiny piezoelectric cantilever sensors, similar to the one pictured here, are being calibrated by Drexel engineers to detect DNA. Cantilever sensor technology, which has been around for a little over a decade, detects its minute targets using a method that is relatable to a springboard bouncing with the movements of a diver. The “board” –or cantilever in this application– vibrates at a higher frequency when the diver jumps off and his or her mass is removed. Conversely, the vibration frequency of a cantilever would decrease when weight is added to it. Measuring the difference in frequency of mass-free versus mass-loaded vibrations allow researchers to detect cells or, in this case, DNA, in samples. Mutharasan and his group combined the PZT material to the cantilever in an innovative design, which allows researchers to initiate the “springboard” effect by applying an electric current. This is an upgrade over the classical cantilever method which requires an external stimulus –a flick of the diving board– to set the system into motion. Because PZT sensors are completely controllable, Mutharasan’s group has discovered high-order vibration modes in certain designs that are sensitive to very small mass changes, on the order of one-billionth of a microgram, in liquid samples. The PZT cantilever device is dually useful because it speeds up the process of replicating DNA in a sample. Replication is a necessary step in the testing process in order to improve the quality of the sample and positively identify the bacteria or cell of its origin, much like growing bacterial culture. Muthrasan’s research group will conduct simultaneous amplification and detection of DNA that is expected to be carried out at room temperature and in a short time frame. Typical replication can be time-consuming because the sample needs to be heated in order to begin the process. The advantage of the cantilever sensor is that double-stranded DNA can be unwound by vibrating the sensor at the proper frequency. This procedure essential step for replication can cut a typical detection process, which could take several hours, down to less than an hour. The National Science Foundation recently awarded the team a grant to continue research into simultaneous DNA replication and detection using these piezoelectric vibrations. The key discovery that Mutharasan’s team is building upon is its observation that DNA can be “melted” –a term describing the process of unwinding a DNA strand for replication– by application of mechanical energy to sensor surface via PZT. With the PZT sensor’s unique ability to test samples in liquids and at room temperature, Mutharasan can foresee applications in detecting food and water contamination, as well as use in the medical field. In early testing the PZT sensor has successfully detected DNA indicators for prostate cancer in urine samples, toxin-producing genes in pathogenic E. coli and an identifying gene of malaria-causing Plasmodium falciparum in patient blood samples. The technology is still likely to be three-to-five years from becoming commercially available for medical and environmental uses, according to Mutharasan.